MADE IN THE USA! 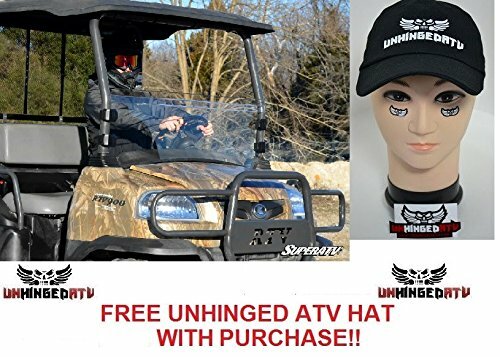 SuperATV Kubota RTV 900 Scratch Resistant Half Windshield and Free Unhinged ATV Hat! by Super ATV at Daily News Miami. MPN: HWS08-001-70-Hat. Hurry! Limited time offer. Offer valid only while supplies last. If you have any questions, please feel free to call us at 1-800-824-8125 and one of our customer service representatives will be happy to assist. If you have any questions, please feel free to call us at 1-800-824-8125 and one of our customer service representatives will be happy to assist. Please note; Your free gift may ship separately from the rest of your order! We've taken traditional and made it EXCEPTIONAL. Help protect you and your passenger from sticks and other flying debris while blazing the trail with a SuperATV windshield - the best off-road windshield on the market. With many protection and tint options to choose from, each windshield is a super tough polycarbonate construction with a bottom seal that's contoured to your ride's design. Our tinted and non-tinted, scratch resistant, 1/4" thick AR Makrolon® is much stronger than your average UTV windshield. We've also beefed up the scratch resistance by hard coating this style windshield on both sides for years of use. All SuperATV windshields comes complete with hardware and instructions needed to make installation a breeze. Proudly manufactured in our facility in Madison, Indiana. Fitment Kubota RTV 900 : 2004-2013 Features 1/4" Makrolon® AR abrasion resistant polycarbonate available with and without tint Makrolon® windshields are hard coated on both sides for extreme durability Protects against chemical and UV attack Contoured to hood with full length rubber seal for a great fit Easy to install - comes with all necessary hardware and instructions Can be used with soft or hard tops Add an LED Light Kit to brighten your night riding! Half Windshield height: 10-9/16"